Autism Walk 2009 | NOVA Cool Cats Special Hockey, Inc.
A large number of Cool Cats and their families attended the Autism Speaks Walk in Washnigton DC. Special thanks to Amanda for putting together the Cool Cats team and to all those who turned out to support this worthwhile event. 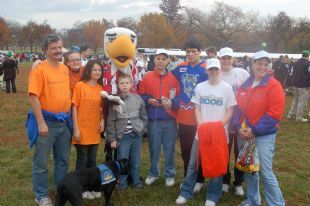 We even managed to have our photo taken with Slapshot.